The mid-to-late 19th century was the first era in which readymade and mass produced furniture was available. The customer had no say over the design of the piece, but could choose from the stock that the shopkeeper offered. This meant that furniture became much cheaper and more people could afford to buy new rather than second hand. 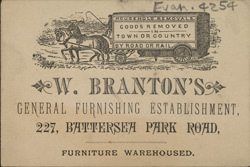 Branton’s General Furnishing Establishment, advertised here, also offered a horse-drawn removal service.